This week several user interface changes were made as part of patch 1.1.2, including some that changed the look of the 'global cooldown' animations. 'Global cooldown' is the delay after an ability is used before other abilities can be used. As the global cooldown can affect many abilities at once, the animation is seen frequently and for some, the changes made were distracting. Our UI team took this feedback to heart and worked up a solution which gives every player a lot more choices in how cooldown animations are displayed. If you're happy with the way the game currently looks, you can ignore these changes - but we think some of these preferences will be welcomed by many players. Here's a screenshot of the new portion of the User Interface section of the Preferences menu which deals with cooldown settings, and some details on the options available to you. Show Ready Flash: This option, when selected, will show the bright flash when an ability finishes cooldown. Show Global Cooldown Ready Flash: This option, when selected, will show the bright flash when an ability finishes its global cooldown. Show Cooldown Text: This option, when selected, will show the time remaining on a cooldown as an overlay on the ability icon. 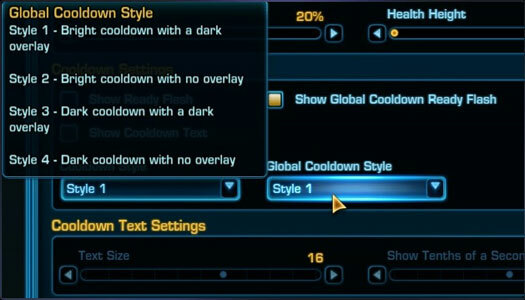 Cooldown/Global Cooldown Style: This option allows you to select from four different art styles for the cooldown and global cooldown graphics. 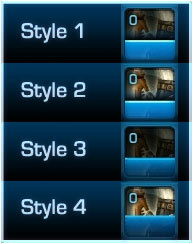 The tooltip for this option explains what the different styles look like (see screen below). Cooldown Text Size: This option adjusts the font size of the cooldown text that's used as an overlay on the ability icon. Show Tenths of a Second: This option adjusts the threshold for when the game starts to show tenths of a second on the cooldown overlay text. To show a few of these options in action, we created a short video. Here you'll see the cooldown animations in a combat sequence featuring a Level 30 Smuggler; we've filmed two versions of the cooldowns so you can see the differences. Hopefully you can agree with these new preferences you'll have a whole lot more flexibility in choosing your cooldown options and can find a style that you prefer. Again, we expect to deploy these changes to the live game in patch 1.1.4, and you'll be able to preview that patch on the Public Test Server soon. Expect to see many more UI customization options in Game Update 1.2 as well!